Originally, I was supposed to have no book tour at all. After all, if you are a first time novelist without name recognition, who will attend your readings? 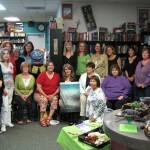 The new trend in book publicity is the virtual book tour via the blogosphere. Indeed, I have been doing a healthy share of Q&A for literary websites I had never heard of before. But this is not the same as meeting people face to face, hearing their reactions to your work, and signing books for them and their loved ones. It was my good fortune, therefore, that independent bookstore owners with the wherewithal to read endless advance copies, stepped up to request readings. Terry Gilman, owner of Mysterious Galaxy Books in San Diego, is a powerhouse of book promotion on the West Coast. She organizes an LA-based “Ladies, Lunch & Literacy” series which brings debut authors to the South Bay to read, give a talk, and enjoy lunch with readers, many of whom participate in local book groups. In addition to the LA event, Terry invited me to her San Diego bookstore for a delicious event called, “Wine, Women, Books & Chocolate,” which offers readers the opportunity to discuss books and their lives in a relaxed, informal setting. While Terry Gilman is a pillar of support for debut authors on the West Coast, Jaime Clark and Mary Cotton, owners of Newtonville Books in Newton, MA, hold up the sky in the East. Newtonville Books is a modestly sized bookstore with a dynamite reading series. In addition to hosting an average of two readings per week, the little-store-that-could has readers’ clubs, writing workshops, and a community blog. On the night I was there, I was lucky to present with Josh Weil, who read from his novella collection, The New Valley. Extraordinary, by the way! Both Mysterious Galaxy and Newtonville Books have impressive collections of signed first editions by a wide array of authors. The family owned Book Revue in Huntington, New York, where I’ll be reading on July 9, has evolved into a Long Island community and cultural center which offers workshops, book groups and children’s programs. Despite its long history of hosting celebrity readings by the likes of Bill Clinton and Caroline Kennedy, the store is just as happy to support local unknowns like me. My siblings who live on Long Island can attest to the loyal support this store receives from its customers. Talking Leaves Books in Buffalo, New York, co-founded by Jonathon Welch, has a contagious passion for books that are idiosyncratic, unusual, original, and stem from inquiring, free-spirited and independent minds. They feel that as our culture becomes more uniform, the voices and visions outside the mainstream become more significant. The store is an icon on the Buffalo landscape, and it will be an honor for me to read there on July 16. These have been tough years for indie booksellers competing against big chains, but those who survived have unique personality and style, and make vital contributions to the communities they share. Here are a few more superb stores that do a tremendous job supporting and promoting new and local authors. These are just a few I happen to know about. If you have one you love, please share it in the comments section. Independent booksellers need us, and we need them.